Finding the perfect WordPress theme if you're a photographer can be hard. There are so many out there that it takes quite a bit of research to find one that suits your needs. Luckily I've put in some time to find some beautiful themes for you. Hopefully you find the one you want and can choose to either purchase the theme yourself or contact me and I can build your website using the theme of your choice. Photographer is a powerful WordPress theme built exclusively for photographers. It includes 24 example demos in both white and dark versions. It aslo includes 70+ gallery and portfolio templates so you can display your photographs in the exact way you want. It has an infinite scroll option much like you see on Tumblr themes, a photo-proofing option in case you want to create a proofing section for your clients, a drag-and-drop content builder so you can build your pages how you see fit, 8 menu layouts allowing you to have the exact header you want and more. Photographer is responsive so it looks great across all mobile devices. It has 9 blog templates so you you're not stuck with one blog layout. If you want a one page site you can do that too with this theme. It even includes cool parallax features you can use, along with the Revolution slider and iLightbox plugins to display your photos in the best way. This them even include Woocommerce support so you can set up a ecommerce storefront to sell photos or whatever you wish. You can fully customize the sidebars, widgets and fonts to get that site you're looking for. All-in-all Photographer is a very robust them with a ton of options that will allow you to create a beautiful photography website easily. 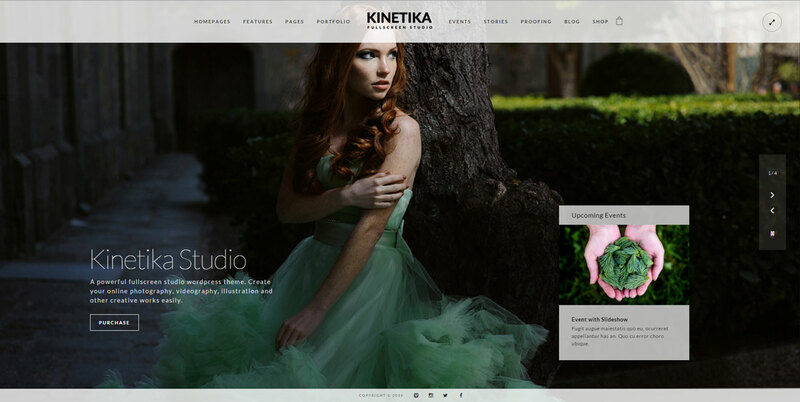 Kinetika is a robust, full screen photography theme which is woocommerce supported and includes built in event posts, photo proofing galleries and variety of portfolio showcase functions. The theme is WPML multilingual ready and includes .po .mo language files for easy localization to any language. The theme is retina ready, fully responsive and easy to customize. Fullscreen slideshows and videos support displaying of Information box populated with Events, Portfolios or Blog posts. Kinetika theme has the ability to display image slideshows and videos as page background with page opacity control per page. Furies is a fully responsive, full screen WordPress them which includes 11 gallery templates, filterable portfolio, skin manager, full screen video support, music support, custom Google fonts and even password protected galleries. Some other options include 6 portfolio templates, customizable colors, image gallery comments support, fullscreen youtube and vimeo video support. RevolutionZ is a modern, stunning and fully responsive theme with fullscreen image and video support. Its modern look is perfect for more modern photography websites. It includes the LayerSlider and Slider Revolution slider plugins. It also supports the WooCommerce plugin so you can easily set up shop and start selling your prints or images easily. Turin is built with HTML5 and CSS3 and coded to take full advantage of what modern browsers are capable of. It’s also designed to be as easy to customize as it is beautiful to look at. It comes with an amazing set of components you’ll love to employ to build the web image of your portfolio. Turin is modern and minimal which allows you to showcase your photography in style. You can have fullscreen images, video or sliders on your homepage. There's really too many options to list, so be sure to check out the demo for yourself. Legrand is a responsive, clean and minimal WordPress theme for Photographers wanting to create a lovely portfolio web site. Built with the latest WordPress technology, Legrand is responsive so it looks great on all devices. It has predefined styling for photographers, creative designers, design agencies which all can be imported with just one click. 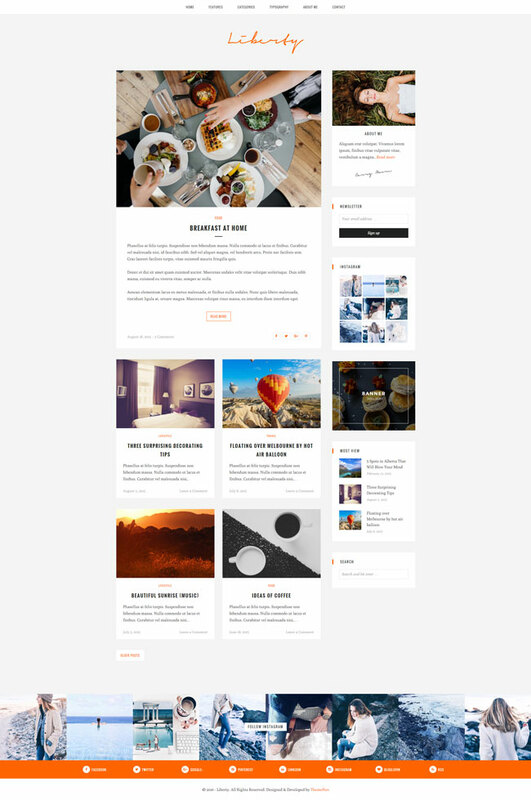 Lydia is a flat and responsive WordPress Theme with a clean and professional design which will be a great solution for your photography business, portfolio or photo blog. Lydia was built with awesome Twitter Bootstrap v3 and it has loads of page builder elements with unlimited color options. Since it is responsive, the layout will adapt to different screen sizes which will make your website be compatible with any device such as smart phones, tablets or desktop computers. Lydia comes with the Visual Composer plugin so you can build your pages however you like. It includes parallax background options, unlimited color schemes, demo insaller, WPML support for multilingual sites, 1-4 column footers, social media sharing options and more. Outdoor is built using the Bootstrap framework and is retina ready and fully responsive. It includes 6 different home page styles including large slideshow, slider carousel, multi-slideshow, static image and even video. Available are 5 different style portfolio archive page layouts and 9 different styles of portfolio single pages. You can use full-screen backgrounds as well as video backgrounds for your pages. Outdoor comes with several premium plugins built-in including Revolution slider and Visual Composer which is a drag-n-drop page builder. Outdoor works with WordPress version 4.4.1+. 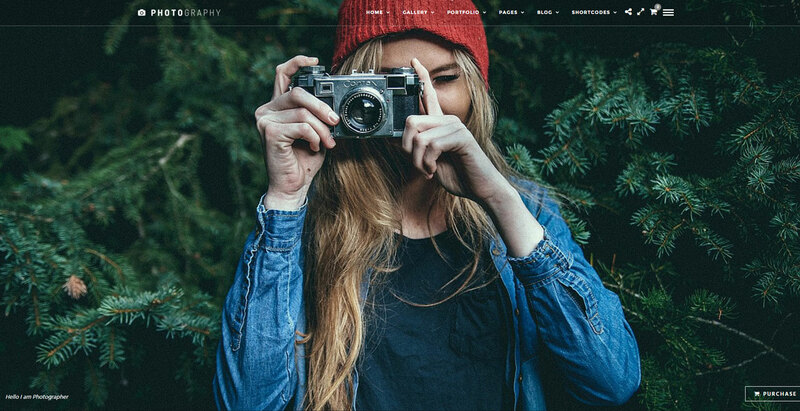 Uno is a simple and clean WordPress theme to help you build a beautiful photography website. Uno doesn't come off as boisterous with a ton of noise… it simply showcases your work in a way that it is the focus. It includes both a dark and light version. As well as two separate layouts, 3 homepage layouts, 3 landing pages, 10 gallery layouts, 6 portfolio layouts, 2 “about us” layouts, 2 “contact us” layouts, 6 different blog layouts and 3 blog post layouts giving you a lot of options to create the exact website you want. Photography is a hard working theme. To say it has a lot of features is an understatement. You really have to view the demo for this theme to get the full impact of what it offers. It comes with I think every feature a photographer would want including things like pages for appointment booking, pricing tables and even a feature to put your images on a map. It includes easy sharing via social media icons, a method of matching a layout color to your photos, a story mode so you can create a compelling reading experience if you're one who likes telling stories, demo content so you can build your site quickly and then go in and replace the content with your. Some other nice features are that they included styled testimonial layouts so you can display your awesome testimonials to your visitors, a method of including project details for each photo as well as giving you 7 different menu styles to choose from, all of which are nicely designed. Photography allows you to sell your photos or prints online using a Woocommerce plugin in case you do want to do that. They've even built copyright protection into their theme by disabling right- click. Password protected pages are easy to create if you want to show a specific client photos that you don't want anyone else to see. This theme is mobile optimized so it actually looks great across all devices. It's really a theme you have to experience for yourself, so head on over to the demo and check it out. Aster is a feminine theme that showcases your photography in a simple and elegent fashion. It includes a horizontal scrolling portfolio which is controlled via mouse, touchpad or even your keyboard arrow keys. Aster gives you two options for where your logo is placed, either on the top left or centered. I know a lot of photographers like their logo centered in their menu so that's a plus. For more styling options you can upload your own background pattern for this theme giving it your own personal touch as well as customizing all the main colors at once using a HEX color wheel within the admin. Aster is responsive so it won't matter if your potential clients view your site from their desktop computer or their iPad, it fits to each screen perfectly. They have also made it easy to create password protected galleries within your WordPress site you can use as a proofing section. It includes a way for your clients to mark which images they like and also leave a comment so a conversation can be created right within their own gallery… Pretty cool. Of course Aster comes with demo content, so with one click you can build your site just like the demo and then go and replace the content with your own. This makes it easy to get your site up and running faster than if you started from scratch with creating the gallery pages etc. 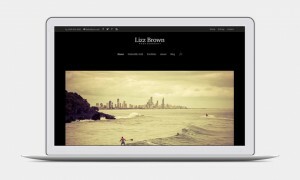 Timber allows you to build an amazingly dymanic photography website with all the features built into it. It gives off a very modern feel with its horizontal layout and animated typography. It would suit photographers or videographers who shoot more “cool” content quit well I think. You can mix landscape and portrait photography seemlessly in your horizontal scrolling portfolios… each image clickable and explandable to give the larger detailed version. It includes features like ecommerce so you can sell images or prints, displays EXIF data if you wish, video support, overlay menu for an easy to access about section and more. Timber is another theme where you just have to go through the demo to get a feel for it. Photographer is a minimalistic photo theme with subtle touches like the animated photowall that give it more impact than say a site with just static imagery. It is responsive so it adapts to mobile devices perfectly and is built using HTML5 and CSS3. It includes 2 different blog layouts (with or without a sidebar) and supports all blog post types. It includes custom widgets for Flickr, Instagram, Pinterest, Picasa, etc) and is easy to customize via the admin panel. Photographer allows you to create a pricing page along with client testimonials, a contact form and serveral gallery styles to showcase your work. The top centered logo is something a lot of photographers like and allows you to display your brand with pride. 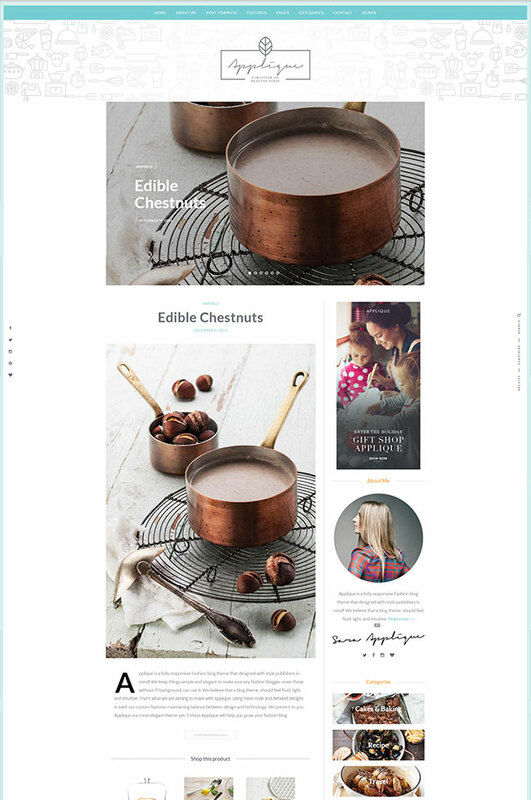 Below are a list of stylish blog themes that are perfect for photographers who write a lot of content to go along with their photos. If you are the type of photographer who not only likes to tell stories with your photographs, but also describe the stories with text than these themes will work great. If you're a photographer who loves to tell stories and prefers to have a regular style blog than Liberty is a good choice. It's in regular blog format but is clean and minimal so you can portray your photos in a lovely format and still have room to tell your story. This theme supports WordPress post formats for standard, gallery, audio and video formats. Liberty theme options panel is based on WordPress Customizer that provides options to change background images, color and typography. Liberty is fully responsive as well and includes 5 different blog layouts. It has “sticky” navigation, support for Mailchimp, 4 custom widgets and is easy to customize. Freyja is a light and versatile blog theme carefully crafted to display your content in a beautiful manner. It has many options to display your content how you like, including 10 different blog page layouts, 8 homepage header layouts, options to display different headers for single posts and categories. That way your archive category pages can be unique from each other. Freyja also includes a featured slider, promo box, advertisement widgets, social widgets, instagram widget and more. It works with WordPress 3.9 and up, has child-theme support and comes with free support and updates. 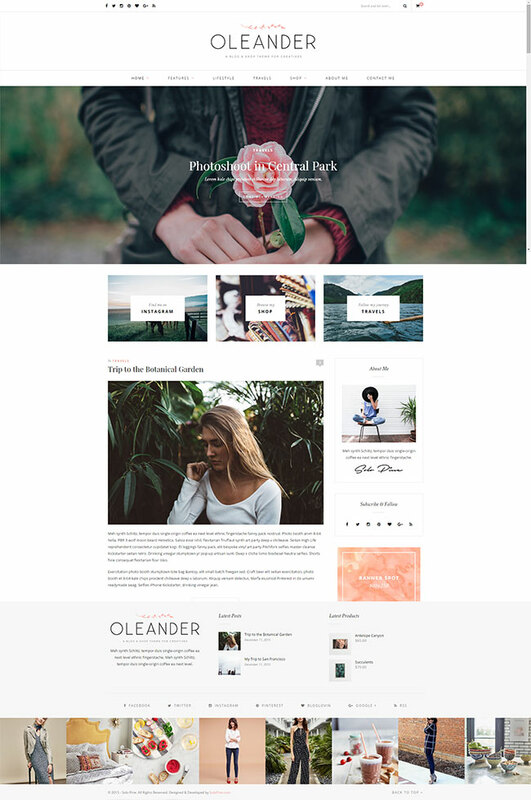 Oleander is a fresh blog and shop theme that has a dramatic full-width slider and a lot of features bloggers who are wanting to earn money from their blog have. Features like Woocommerce support and promo/advertisement areas allow you to promote things like photo session deals, canvas prints, custom prints or anything you sell as a photographer. Oleander is fully responsive, includes 5 different blog layouts, 3 column footer area ready for all your widgets and also an impressive full-width instagram feed in the footer. It has custom widgets for Mailchimp so you can build your newsletter subscribers, social widgets for Facebook and more. Be sure to check out the demo to get a better idea of Oleander. Applique is advertised as a fashion blog theme, but when I first saw this theme I thought it would be perfect for any type of of photography. When you view the demos there is one called Food Classic that showcases food photography and that is why I thought this would be perfect for any type of photography. View that demo and see what I mean. Applique is fully responsive, built with the latest coding standards, includes demo content for a fast install, allows you to auto-upgrade your theme from your control panel for newer versions, and comes loaded with a lot of cool features. Along with many different page layout templates it also includes way to monetize your blog with affiliate metaboxes, advertisement space, adsense ready and more. There's really too many options and features to list, so be sure and check out the demo. 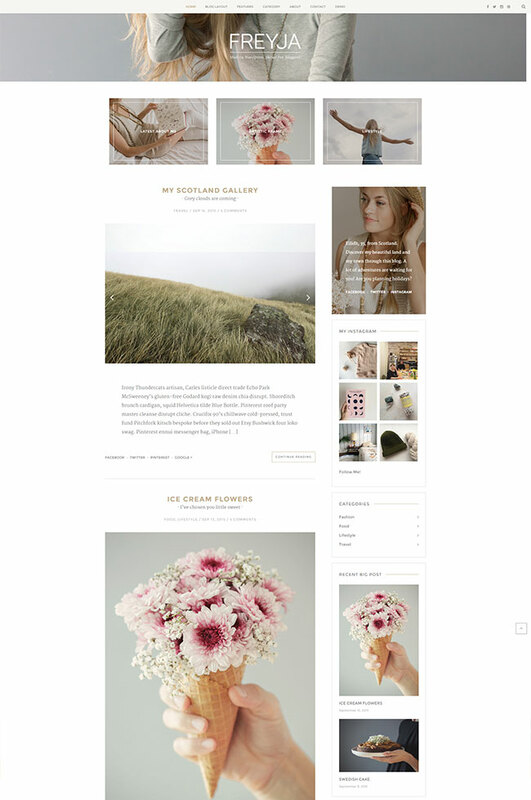 Tomas & Daisy is a theme you can customize for either masculine or feminine style blogs. It's fully responsive and stylish showing that the design was really well-thought out. A unique feature of this theme is that its headers include floating (animated) graphics giving the theme a really custom feel. All its features are customisable from the powerful admin panel. It comes with powerful plugins such as the LayerSlider plugin and the Visual Composer plugin which allows you to create pages and posts however you want with simple drag-n-drop functionality. It has custom widgets, one being a lovely Instagram footer widget. You can customize fonts and includes the Font Awesome icon font pack, Font Elegant icon font pack, Linea icon pack, Simple line icon pack and more. There are custom widget areas, social sharing features, cuse r and more. You really have to check out the demo to see how beautiful this theme is. I know how difficult it can be to choose the right WordPress theme. As a builder of websites it's important for me to keep track of new themes coming out so I'm always have my eye on the pulse of the theme industry. Here's a few tips if you're just starting out, or looking for a new theme for your site. If you're purchasing themes from ThemeForest it's important to investigate the theme author a bit to make sure you're buying a theme from someone who will keep it up to date. It's super frustrating buying a theme and receiving zero updates or support. Remember ThemeForest does not require it's authors to offer support. Although most theme authors support their themes, some I've noticed are really lacking in the support department. I've seen authors disappear completely and at that point you're just out of luck. I've purchased themes on themeforest to only find they've been removed with no notice and you're basically stuck at that point because Themeforest does not offer refunds. How long has the author been on Themeforest. How many comments does the theme have and is the author answering customers questions or not in a timely manner. How many sales does the theme have compared to comments. I look at the demo in my browser and view it without css enabled so I can view the H tags and how the structure of the site is compiled. I look at how well written the description is. If a lot of work has been put into the description and the English is well written then I can defer that they've put the same effort into their theme. I often look at what country the author is from to see if they are abroad or in the US. I look at the overall sales of the author to see if their products are popular or not. Just to note, there are some benefits to purchasing a theme from TF such as you never need to pay for updates. Theme updates are offered for free depending on if the author chooses to update the theme or not. Even if it's two years later you can download and install the newly updated theme without further cost. Also, because TF is a marketplace there is a huge pool of active designers on it giving you a wider range of choices. Another great thing is that you can see how many purchases a theme has had… so you kinda get an idea of how many other people are using the theme allowing you to jump on something new which maybe not a lot of other people are using. I've been a member of ElegantThemes since 2006 I believe… so a long time. Nick Roach is the owner of ET and has been producing new themes on a regular basis since its inception. It started out as a $19.95 yearly membership in the beginning and since has moved up to $69/year for their personal plan but the amount of themes has increased making the higher price worth it. You can now access 87 themes where I think when they debuted it was around 20 or so. The value for the money is unprecedented in the WordPress theme industry. 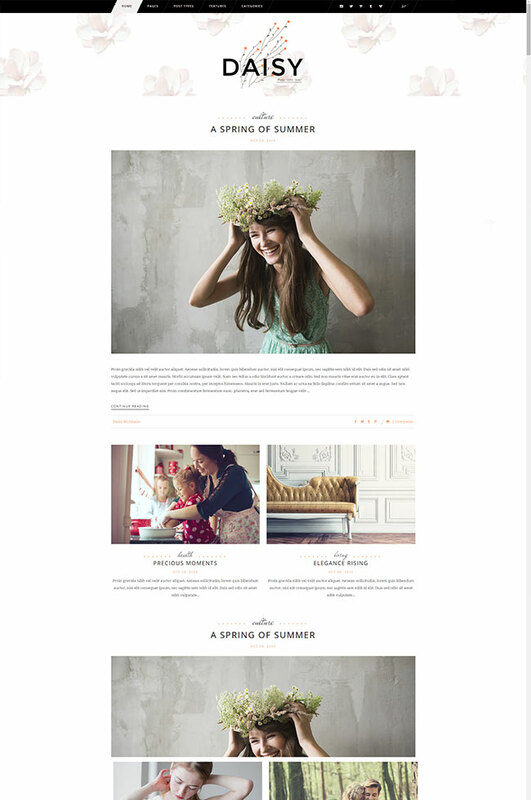 And now with the release of their Divi theme you can create a beautiful photography website. The price has always been attractive for what you receive. ET also offers a 30 day guarantee whereas TF does not. So if you're unhappy with your ET theme membership you can get your money back if you're not totally satisfied. With an ET membership you can literally download any theme you want from them so you're not stuck to paying $40 for one theme like you are on TF. That means if you download one theme and are not happy with the results you can go download another and see if that is to your liking without having to fork out more cash. It's by far a better deal. ET also offers a developer license (which I have) that allows you to use their themes for client sites and pretty much on unlimited sites overall… so if you, by chance have more than one website you can use multiple ET themes across your sites. One of the best things about using a CMS like WordPress for your site is that you can easily change your theme any time you want without much hassle. Over the years you'll find that you get tired of your site design and want to update it to something you're more fond of and WordPress makes that easy to do. Keeping your site fresh, even if it's just a theme change can tell the search engines that someone's home (if your site hasn't had many updates otherwise)… calling back those spiders to re-index your site. So it can be good for SEO too. At any rate, I do hope you found this post useful. It sure took a long time to create. If you did, please comment, subscribe, like… all that good stuff. Thanks for reading and take care! Oh, and if you're great at photography, but not so great at setting up a WordPress or a WordPress theme than contact me. I can set up your new theme for you.